Discover teaser of the new Michael Jackson’s posthumous album called Xscape, which we announced today. The Estate of Michael Jackson have announced today the release of a new album on 13th, May. It’s entitled « Xscape » and will be available on 2 differents versions : an album with 8 remixs songs and a deluxe album including both remixs and original versions. The tracklist is still unknow. Pre-orders will begin tomorrow April 1 on iTunes. Barry Gibb just published a new video. We can see him with Michael Jackson, during the recording of ‘All In Your Name‘ song. This is an extract from the documentary of Barry Gibb and his son, Ashley, who shooted the creation and the recording of this song. As we told you here, the song and the video clip are already available. ‘Michael Jackson Immortal World Tour’ in Europe ! « The Immortal World Tour », the tribute to Michael Jackson, is coming to Europe ! You can access to presale by clicking here. Here are the first dates. Enjoy ! >Ubisoft revealed the release of 3 new songs on the Ipad HD version of the game « Michael Jackson : The Experience« . The songs are Bad, The Way You Make Me Feel and Ghosts. You can download these songs right now. 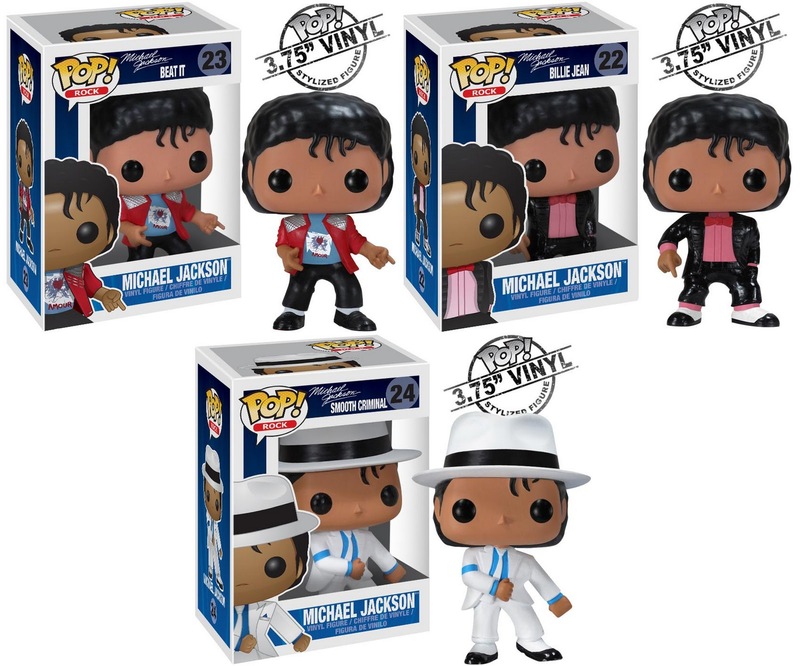 Funko have announced the release of 3 brand new Michael Jackson Pop Vinyl figures : Beat It, Billie Jean and Smooth Criminal. Figures are 3.75 inch of height. You can pre-order these on ToyWiz. The Estate will be joined by Michael Jackson’s three children, Prince, Paris and “Blanket” who will use their father’s sequined glove and shoes to make impressions in the cement in the famous forecourt of the theatre as family, friends and fans celebrate the legacy of the King of Pop. The event is produced by the executors of the Estate of Michael Jackson, John McClain and John Branca. A special live presentation from the cast of THE IMMORTAL World Tour will be performed , and the event will be M.C.’d by Access Hollywood and Access Hollywood Live’s anchor Billy Bush. Michael Jackson is one of the most beloved entertainers and profoundly influential artists of all-time. To date Jackson has sold an estimated 1 billion records worldwide, released 13 No.1 singles and became one of a handful of artists to be inducted twice into the Rock and Roll Hall of Fame. The Guinness Book of World Records recognized Jackson as the Most Successful Entertainer of All Time and « Thriller » as the Biggest Selling Album of All Time. Jackson won 17 Grammy Awards including 8 in one year, a record in itself, and received 26 American Music Awards, including the Artist of the Century Award. Jackson defined the art form of music video with such ground-breaking short films as « Billie Jean, » « Beat It » and the classic « Thriller, » which in 2009 became the first and only music video inducted into the National Film Registry of the Library of Congress. Jackson’s sound, style and dance moves continue to inspire today’s performers and new generations of fans worldwide continue to discover his artistry. The Estate of Michael Jackson just announces that they agree the release of 3 duo songs of Michael Jackson and Freddie Mercury. The agreement concerns Roger Taylor and Brian May, members of the group Queen. The 3 songs are State of Shock, There Must Be More To Life Than This and Victory.